The caves and fortresses of the Hills change hands between the Greek and Turk besiegers of the Castle, who were setting up their bastions on Agia Marina, on Seggio (Philopappos) and the Pnyx. The Philopappos Hill plays a significant role to the supply operations, like in October 1826, when 450 men of captain Kriezotis put into rout the few Turks guarding the Hill, until they were able to make their way to the Acropolis safe and sound in order to help the besieged. Sourmelis 2011 , 227; Vlachogiannis 1901, 32–222. 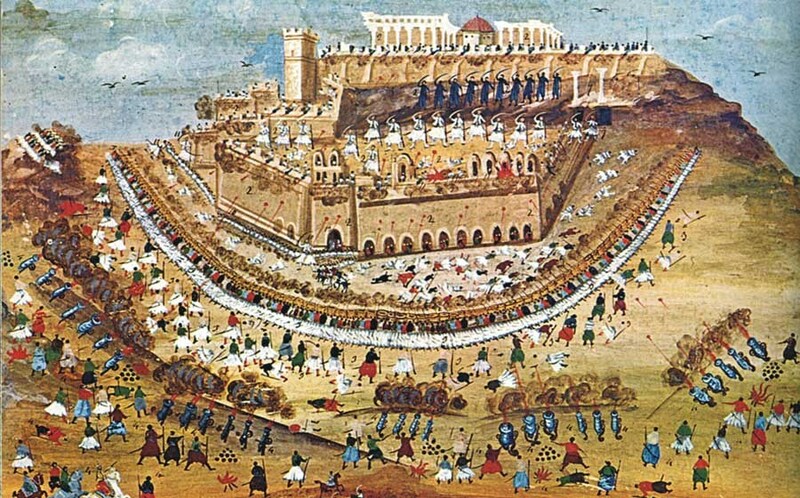 A battle scene during the Greek Revolution, south of the Acropolis. One of the many paintings by Panayiotis Zographos painted under the guidance of Makriyiannis (1836–1839).